If you are reading this, then most probably you are passionate about books. And we understand how important it is for you to have a reading corner which is cosy, refreshing and acts as a getaway from the rest of the world. Even if you are not an avid reader; a quaint reading corner with a few books or magazines can enhance the elegance and charm of your home. 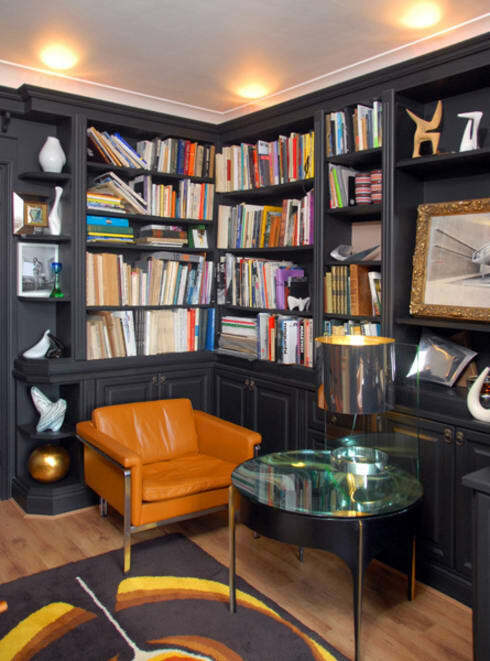 Most often, modern apartments don’t offer enough space to have a full fledged library or study room. Or there may be an odd corner in your bedroom or living room, which you are not sure how to utilize satisfactorily. In both scenarios, putting together a reading sanctuary can be a very good idea. It can be as simple or as decorative as you please. Here, we talk about the different aspects that you should definitely keep in mind when creating a reading corner. Find out all about the perfect seating, lighting, decor and much more. Are you a bookworm? Then you know how delightful it is to curl up in a plush armchair, and put up your feet on a footstool while reading. And this is exactly why the reading corner pictured above is so inviting. The violet futuristic chair equipped with soft cushions, promises a snug time. Ample natural light enters through the large window during the day. And a beautiful reading lamp on the dainty side table provides light in the evening. The simple shelf is ideal for organizing loads of books. Suitable seating arrangement has also been made in case other book-lovers come over to share their thoughts over tea. The presence of a shelf naturally augments the look and feel of a reading corner. Moreover, you benefit from the easy access to all your favourite books. Take a look at the image above to appreciate the necessity of shelving units. This shelf not only holds books but also beautifully displays knickknacks and artworks. A chic tan-coloured armchair and a smart patterned rug add elements of interest. Finally, the ceiling lights effectively infuse a feeling of cosiness. Depending on the amount of space you have and the number of books you intend to keep, you can either go for a modest shelf or large floor to ceiling version. If you want to save on the floor space, pick sleek, tasteful wall units. If you are someone who needs to sit straight while enjoying a book, then getting a table for your reading nook can be helpful. It can easily serve as a study or work station too. Select the size of the table based on your specific requirement, so that it never feels cluttered. If you are planning to adorn it with a flower vase or handicraft items, then choose a big table. Please bear in mind that it is not essential that you have to stick to the traditional 4-legged varieties. For instance, you can go for a design which appears like an extension of the bookshelf, as shown above. 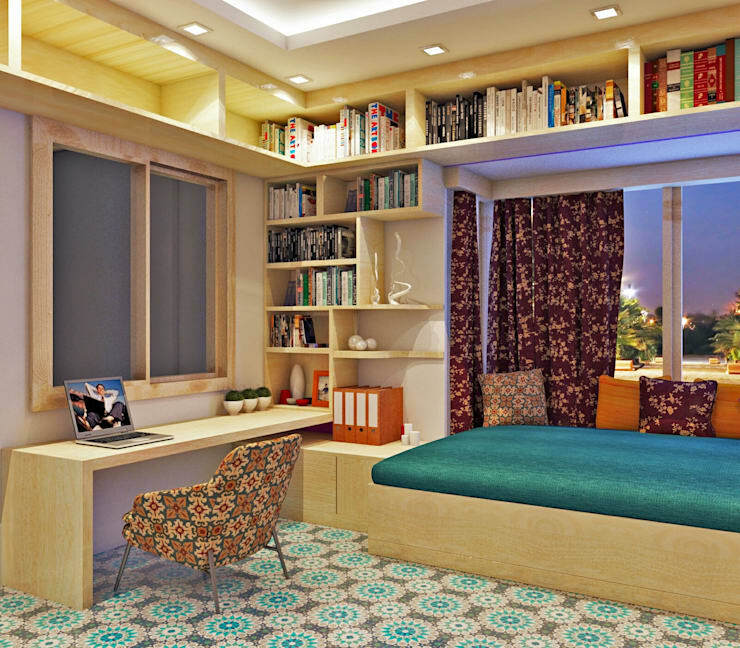 This room is the brainchild of Creazione Interiors, interior designers and decorators from Kolkata, India. The table has enough space for laptops, books and tiny potted plants or artefacts. The chair has been upholstered with eye-catching fabric and a divan fitted with vibrant cushions acts as a respite, when you want to take a break from reading. Reading is meant to provide you with joy and relaxation, and hence should not cause strain on your eyes. Proper lighting is also mandatory when you are working for long hours on your laptop. If possible, install your reading seat near a window which allows abundant sunlight to fill the room during the day. Use sheer curtains to enable the optimum diffusion of light. Or else, you can go for tripod lights for a convenient and soothing reading experience, as shown above. Don’t miss how the comfy chair and the lovely rug add warmth to the ambiance. 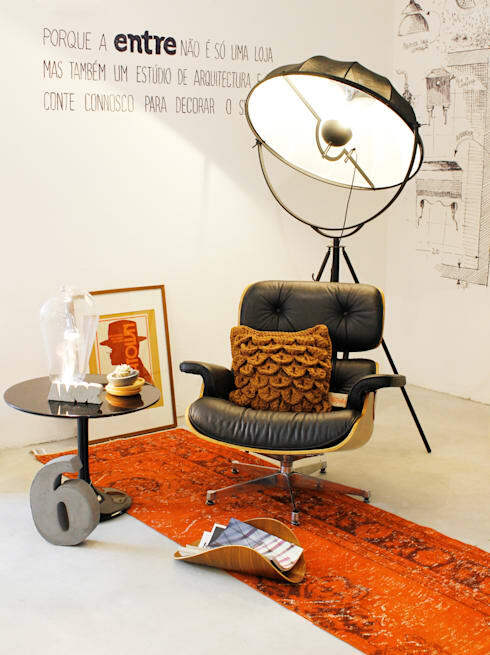 Table lamps may work amazingly well at times, as long as you feel the light they offer is sufficient. Whether you are choosing a chair, or cushions, or rugs for your reading corner, make sure that the textiles are soft and super comfy. It can get you hooked to the space in no time. Go for plush pillows, lavish throws or silky faux fur rugs. Check out the gorgeous and welcoming seat pictured above, for ideas. 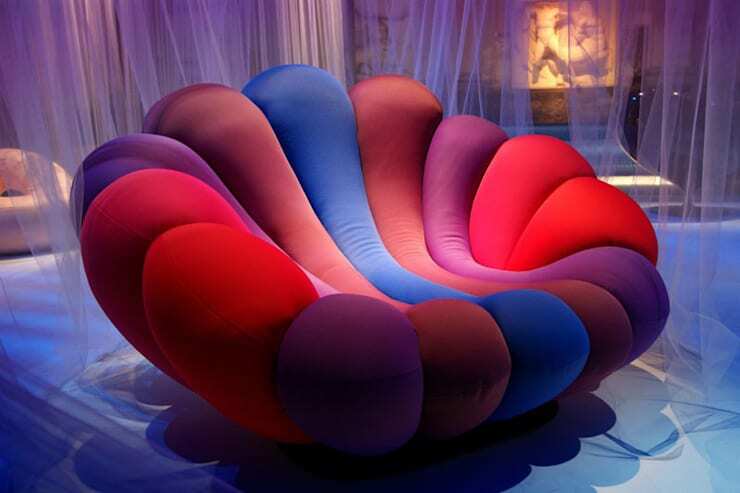 Inspired by the shape of an anemone, this chair promises to deliver sheer ecstasy whether you are poring over the latest novel in your collection, or planning to take a short nap after reading for hours. Soft textiles may reduce your productivity when used for work stations; but if the reading corner is a spot for unwinding, then you don’t have a reason to worry! For those who can’t survive without reading, a chair, a table lamp and a small stack of books is often more than enough. But if you want to make the reading corner more attractive, unique and visually appealing, then there are easy ways of doing so. Adding decorative elements like potted indoor plants, figurines, or framed art can enhance the style quotient of the spot quite easily. House plants offer many health benefits too. Take a clue from the study shown above. 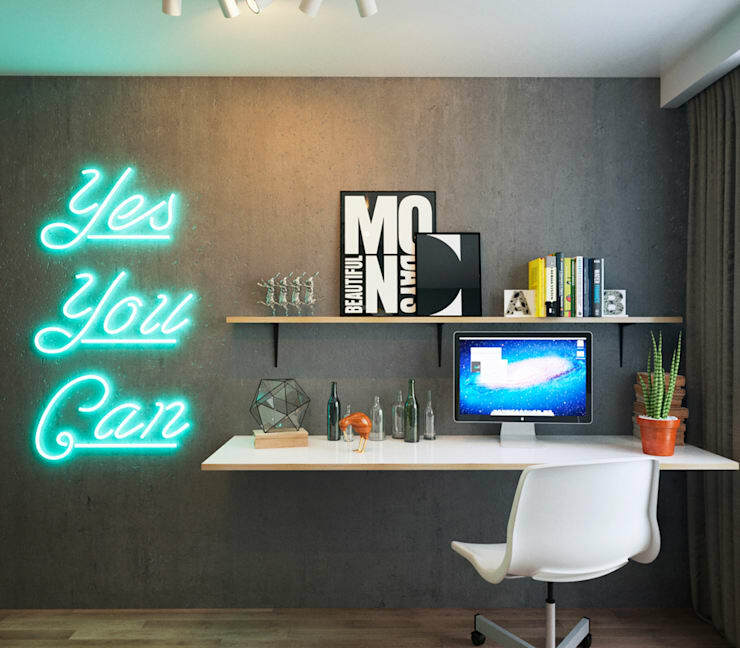 Observe how a funky wall decal has spiced up the appearance of this corner. You can also pick colourful posters, wall hangings, bright rugs, fresh flowers, or quirky showpieces to attain the look you desire. Now that you know all the tips and tricks of creating an enticing reading corner, you must be dying to put them into practice. In case you are moving into a new house or remodelling your old house, you may also want to consult an interior designer to assist you with other brilliant ideas. 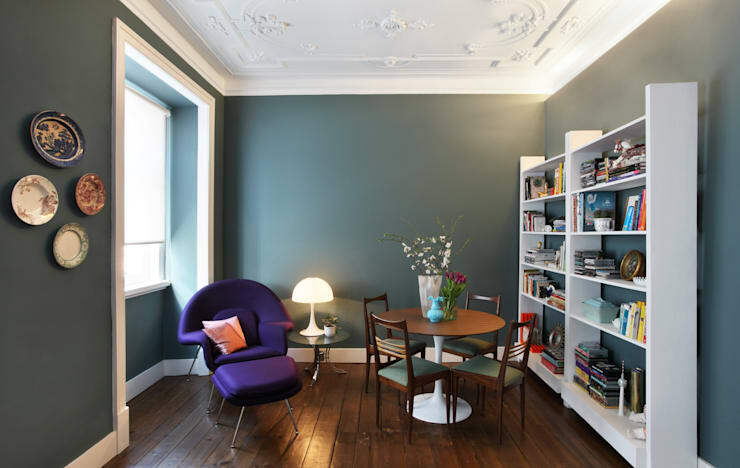 Here is another ideabook to inspire you – Create a cosy corner in your house.